This page explains the principles of New Zealand signalling and safeworking. The emphasis is on automatic signalling and the Hutt Valley Line. (Right) The Johnsonville Branch Up Departure signal. The All Trains Stop board was installed after a wrong side failure with a tri-colour signal head in Australia (Jan 2008). Special procedures applied to passing this signal until the tri-colour unit had been replaced with a three light LED unit. The smudge is on the EMU front window, not the camera lens! 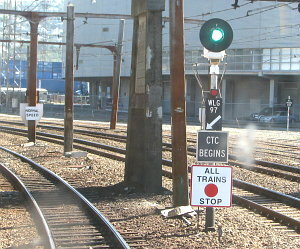 The safe operation of a railway depends on the signalling (i.e. the hardware) and the operating rules that define how the hardware is to be used (i.e. the software). My Signalling Overview page decribes the combinations of hardware and rules used in New Zealand. Signal aspects are explained in New Zealand Signal Aspects and also the NZR training document Illustrated Guide To Three Position Colour Light signals. This booklet dates from the 1960s or 1970s and does not describe two newer aspects - Advance Caution and Intermediate Speed. My Medium Speed page uses a diagram and a sequence of photographs to explain medium speed. The location is Trentham and I also show how the meaning of a signal can be changed by a speed board. Read about the differences between Two-Position and Three Position signalling. When the sighting distance of a signal is insufficient aspects can be repeated by banner indicators. The signal classification determines the rules that apply when a signal is to be passed at stop. A set of six photographs demonstrate overlaps on the Hutt Valley Line. My Subsidiary Lights page describes the subsidiary lights used or proposed for use on the New Zealand railway system. Diagrams and photographs explain A-Lights. A set of three photographs show a low speed light signalling a train onto an occupied track at Wellington Station. A diagram and photographs explain signal markers. At Maymorn a full size searchlight unit is used as a marker light - see my Large Signal Marker Light page. The railway in New Zealand has used various signal configurations for controlling the exit of a train from a loop - ground lights, single unit running signals and double unit running signals. My Loop Exit page uses diagrams and photographs to document examples between Ngauranga and Featherston. In southerly conditions the section through Ngauranga sometimes requires permissive working. Sea water on the tracks drops the track circuits putting the signals to Stop. This is demonstrated in these driver's photographs. Two methods of permissive working. Approach cleared Low-Speed lights allow trains to stack up without the intervention of the signalman. Searchlight and three lens signals. New Zealand railways use speed signalling. However there are locations where the signalling indicates the route and speed boards define the authorised speed. One example is Up trains at Wellington Junction. In contrast Down trains at Wellington Junction are directed with signals that more closely follow speed signalling conventions. On both of these pages I use a diagram and some photographs to show how notice boards can change the meaning of a signalling installation. The arrangements described on these pages were superceeded in 2010 when the Junction was rearranged, a third main brought into use and a computer based interlocking commissioned. I have scanned a 1937 diagram of Wellington Station in two parts. The north end shows the original junction layout. The south end shows the platform names and the dotted in tenth platform. A diagram and photographs explain the rules applying to mechanical points indicators. Trap points and safety points protect the mainline and loops from runaway vehicles. I have created a series of pages which use diagrams and photographs to explain the mechanisms used to operate these points. To learn how the horizontal motion of a rod can be converted into three separate actions - unlock the facing point lock (FPL), throw the switch, lock the the FPL, visit my Economical FPL page. Mechanism operated by motor, lever or rodding. Rodding fitted with temperature compensator. Switches individually detected or combined with a scalebeam. Switches fitted with a facing point lock. Switches fitted with an "Economical" facing point lock. Traps protected with colour light or points indicator. Mechanism located next to points or some distance away. 1943 Regulations for Working Single Line Railways by the Train Staff And Ticket System. 1965 Regulations for Working Single Line Railways by the Electric Train Tablet System. 1965 Regulations for Automatic signalling. Generic Track Warrant Control Regulations. In 2004 at Masterton some interesting relics of late 19th/early 20th century signalling are still in regular use on the commercial railway. Masterton is the only location I know of where a Woods key is still used and is one of only two or three stations that have two-position signals. My Hutt Valley Signalling History page documents the history of signalling in the Hutt Valley and also on the Rimutaka tunnel route to Featherston. In March 2002 a low-speed light was installed on the Up Departure signal at Pukerua Bay. The purpose was to allow Up EMUs to reverse on the single line during a Block Of Line. The line was closed between South Junction and Waikanae for tunnel floor lowering and other work. Pukerua Bay is on the North Island Main Trunk Line (NIMT), not the Hutt Valley Line. However the signalling work was so interesting that I have included it on my site. Visit my South Junction Temporary Signalling page for details of this work. The page also explains signal classes, Mis 59 forms, low-speed lights and the normal South Junction signalling. Stop on Green & proceed on Yellow to reduce delays. Low-Speed lights prove track clear. Starting signals at Ngaio and Khandallah to allow trains to be divided. Mechanical signalling at Thorndon, Ngaio and Johnsonville. Speed control with train stops. A variety of boards are seen by drivers as they go about their daily work. Although the same set of rules applies to every shunt signal, the way in which individual shunt signals operate can differ. I explain the rules applying to shunt signals and then, using Petone as an example, explain some of the ways in which their operation can differ. My Comparative Aspects page compares the aspects used in New Zealand with those used by the Rail Infrastructure Corporation (RIC) in NSW and the Burlington Northern and Santa Fe (BNSF). The comparison is not a comprehensive explanation of RIC or BNSF signalling. The purpose of the page is to demonstrate that there are many different ways of defining colour light signal aspects.